With a light hand, the term entrenched itself for the artistic movement “Fauvism”, which was based on Matisse and his colleagues. Reality is perceived by Matisse through a kaleidoscope – colorful, lively, fun, with a kind of challenge. The colors of the pictures are bright, screaming, the forms are simple, but they fully convey the plasticity of the movements. The canvas “Dance” and “Music” were commissioned by the Russian collector S. I. Shchukin. It was a sensation! In the painting “Dance” we see five female figures dancing in a round dance. No background, not a single extra detail, just a process. The sounds of music take over the bodies of the dancers, their grace, the bending of bodies clearly show the dynamics. A picture, as if alive, looking at it, we feel like vibrations and are ready to join the dancers. Not by chance, the idea of ​​a round dance was so successful that it was repeatedly repeated by the artist, and also picked up and interpreted by sculptures and dance directors. 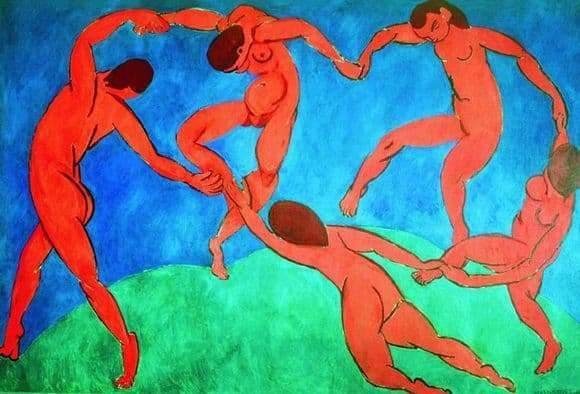 The reality is portrayed by Matisse in his own way, his dancers do not have ideal forms, they seem to be from another dimension, but at the same time attractive and beautiful. The latter almost did not become a reason for the collector’s refusal to pick up an order, but prudence took up over stereotypes. Female bodies are not completely proportional, hairstyles are simple, faces are not drawn, only brush strokes convey emotional ecstasy. At the same time, the dance is noble, the female dance is fascinating with its naturalness, ease – this is its colorful world, living according to the laws of rhythm. The picture is large, its length is 4 meters, so looking at it, you can feel the power, integrity. The painting “Dance” is the author’s desire to fix the moment of life, which we managed to perfection.